Nothing is more important than your and your family’s good health. Zovio recognizes that you have different needs when it comes to your medical plans. That’s why we provide you with plan choices that help you and your family achieve optimum health. We offer you the choice between three medical plan options. View a high-level plan comparison. What are Account Based Plans? The Wellmark Alliance Select medical plans pair a Consumer Driven Health Plan (CDHP) with an account to help pay for some of the costs of eligible health care expenses. You’ll be responsible for an annual deductible before the health plan begins to pay for certain eligible expenses. For the 1500 Copay Alliance Select HRA, some services require only a copay and don’t require you to meet the annual deductible first. Once your deductible is paid, you’ll pay a percentage of the cost (coinsurance) for your covered health care expenses. The account helps pay your coinsurance, prescription costs and your deductible. The HRA CDHP plans have a non-collective family deductible, which means that once an individual in a family has met the “individual in a family” deductible, covered expenses for that family member will be paid at the coinsurance level specified by the plan. They also have a non-collective family out-of-pocket maximum (OOPM), which means that once an individual in a family has met the individual OOPM, their covered services will be paid in full. The HSA CDHP plan has a collective family deductible, which means that any individual in a family must meet the entire family deductible before covered expenses for that family member will be paid at the coinsurance level specified by the plan. They also have a collective family out-of-pocket maximum (OOPM), which means that any individual in a family must meet the entire family OOPM before their covered services will be paid in full. Each year, Zovio puts money into your account. These funds can be used to cover health care costs that are eligible under your health plan, including deductibles, coinsurance and prescription drugs. You can also contribute pre-tax dollars if you are enrolled in the Wellmark 2000 Alliance Select with Health Savings Account (HSA). With the Alliance Select Copay HRA plan, you will pay set copays for certain in-network services like office visits and chiropractic care. You do not need to meet your deductible before copays apply. This is an amount you pay each year before your health plan begins to pay for covered medical and prescription drug benefits (excluding in-network preventive care and certain preventive medications). Once your deductible is paid, your health plan shares the cost of eligible expenses. Generally, you’ll pay coinsurance. With coinsurance, the plan pays a larger percent of the cost of care (80%) and you pay a smaller percent (20%). Once your deductible and coinsurance add up to the plan’s annual out-of-pocket maximum, the plan will pay 100% of all eligible covered services for the rest of the plan year. Start the year with an HRA funded by Zovio. Visit a doctor, dentist or other health care provider. After your visit, Wellmark gets a bill. Wellmark sends you an explanation of benefits (EOB). It shows how much you owe for your health care services. If you previously paid a copay, there will nothing else owed. Wellmark sends you an explanation of benefits (EOB). It shows how much you owe for your health care services. You can choose whether you want to have your bill paid directly from the HRA fund or pay it out-of-pocket. Click here for instructions on how to change your auto-pay preference. * You do not need to meet the deductible before copay amount apply. ** Prescription drugs will be covered at the coinsurance rate but the cost will not apply towards the deductible. Zovio funds your HRA based on the schedule below. You will receive the full amount listed below depending on when you enroll in the plan. Starts with a Health Savings Account (HSA), established through Zovio with Wageworks, that you and Bridgepoint can put money into. Visit a doctor or other health care provider. You will get a bill for the balance owed to the doctor after your health plan has paid for services. * You pay 100% of prescription drug costs until the deductible is met. Prescription drug costs apply towards the deductible. 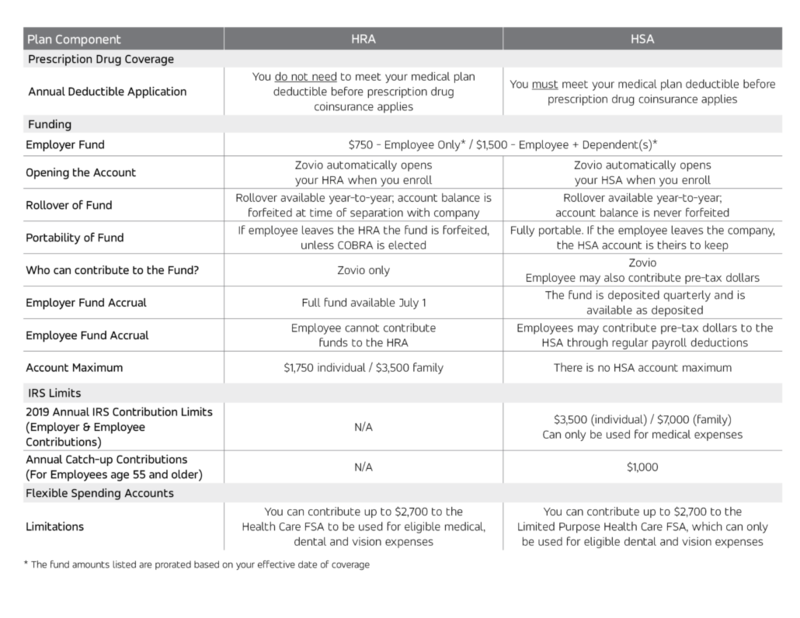 Zovio funds your HSA quarterly based on the schedule below. The amount you receive in your fund each quarter is prorated depending on when you enroll in the plan. It is important to be an informed consumer, especially with your prescription drug options. The Wellmark medical plans include prescription drug coverage. The Wellmark pharmacy network includes more than 60,000 participating pharmacies, including local pharmacies and major chains throughout the United States. Some of these pharmacies include Walgreens, Hy-Vee, Walmart and Target. Wellmark Alliance Select plans with HRA: no deductible applies to your prescription drug coverage. Wellmark 2000 Alliance Select plan with HSA: you must meet your medical plan deductible before coinsurance applies. If you find yourself on a specialty drug, the last thing you want to worry about is getting to the pharmacy or waiting for your prescription. Wellmark has made it easy by working with two specialty pharmacy providers to receive your drugs. Hy-Vee Pharmacy Solutions and CVS Caremark Specialty Pharmacy. These experts specialize in the delivery and clinical management of theses specialty drugs. Both pharmacies will deliver your specialty drugs directly to your home or office, often with next-day delivery. You can also choose to have your drugs delivered to your physician’s office or your local Hy-Vee or CVS pharmacy for pick up. Click here for more information. If you take maintenance medications for conditions such as high blood pressure, asthma or diabetes, Wellmark’s home delivery pharmacy is a convenient option!! Present your medical plan ID card at a participating pharmacy. You will receive up to a 30-day supply for your prescription. You will pay a portion based on the type of prescription you receive. You can save money by asking for generic drugs. The FDA requires that generic drugs have the same high quality, strength, purity, and stability as brand-name drugs. The next time you need a prescription, ask your doctor to prescribe a generic drug when it is available and appropriate. Preventive medications are used for the prevention of conditions such as high blood pressure, high cholesterol, diabetes, asthma, osteoporosis, heart attack, stroke and prenatal nutrient deficiency. If you are enrolled in the 2000 Alliance Select with HSA, you may not have to pay your deductible for preventive medications. There’s no better way to protect your smile than with regular dental checkups. Your dental coverage, provided by Cigna helps with the cost of many dental services, including orthodontia. The Cigna Dental PPO dental plan is designed to allow you to receive care from any dentist you wish. Select a dentist or specialist from the in-network DPPO or DPPO Advantage list and pay less for covered services because in-network dentists have agreed to offer services at lower negotiated rates, approximately 35% off average area charges with DPPO Advantage and 15% with DPPO. And if you visit a network dentist, no claim forms are required! If you utilize a non-network provider, these providers do not have contracted rates with Cigna and may have higher out-of-pocket costs than in-network providers. If you are enrolled on one of the Cigna Choice Fund HRA plans – your HRA funds can be used for your Cigna dental expenses. For a list of Cigna Core Providers, visit www.mycigna.com or call 800.244.6224. Zovio provides vision coverage through Cigna. Well-known retail chains such as Sears Optical, JC Penney Optical, Pearl Vision and Target Optical are part of Cigna’s extensive network. You can see a Cigna in-network provider or an out-of-network provider. Your costs will be lower if you visit an in-network provider. If you visit and in-network provide you will be responsible for a copayment at the time of your service. If you receive services from an out-of-network doctor, you’ll pay all expenses at the time of service and submit a claim for reimbursement up to the reimbursement amount. You will receive a separate vision ID card. To locate and select a provider, visit www.cigna.com or call Customer Service at 877.478.7557.